Welcome to the eighth installment of PuzzleNation Book Reviews! Our book review post this time around features John Halpern’s The Centenary of the Crossword. With the hundredth anniversary of the Crossword only a few weeks behind us, interest in puzzle is perhaps at an all-time high. With that in mind, constructor John Halpern has put together a tribute to the crossword that’s part history, part solving tool, and part celebration of everyone’s favorite pen-and-paper puzzle. It’s a wonderful introduction to puzzles for anyone looking to get into solving crosswords. Beyond the timeline of puzzle history and glimpses into the minds of various constructors (or setters, as they’re known in England) and crossword editors (Rich Norris of the Los Angeles Times and Will Shortz of the New York Times included), Halpern offers numerous solving hints, including a terrific breakdown of cryptic cluing for fans of British-style crosswords. Not only that, but the book is chock full of complete puzzles for the reader to solve, starting (quite appropriately) with Arthur Wynne’s marvelous “Word-Cross” and proceeding straight through to the modern day, featuring constructors from around the world. These puzzles show the depth and variety of crossword grids and cluing, and I think even well-established solvers will get a lot out of tackling the puzzles Halpern has collected. The book is capped off with interviews with the top solvers from last year’s American Crossword Puzzle Tournament, some terrific clues (including some from PuzzleNation Blog favorites David Steinberg and Doug Peterson), and a delightful collection of crossword-centric anecdotes, weird words, and impressive anagrams. 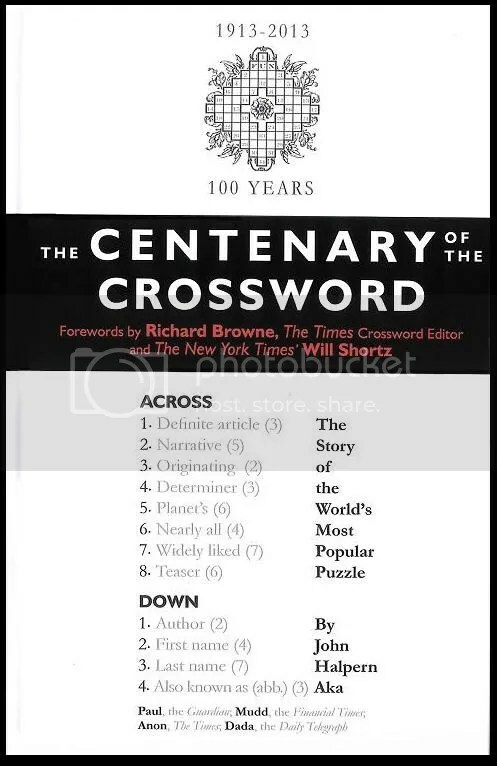 Essentially a cross-section of modern puzzling and the rich puzzle community, The Centenary of the Crossword is a quick and informative read, peppered with puzzles to engage and challenge you. I’m happy to report that I learned a great deal about crosswords (especially cryptics!) from Halpern’s work, and enjoyed every minute of it. What a treat. This entry was posted in PuzzleNation, Puzzles and tagged 100th anniversary, 100th crossword anniversary, anon, Arthur Wynne, Book review, Cluing, constructing, construction, crosswords, dada, David Steinberg, Doug Peterson, Geeking Out, john halpern, mudd, New York Times, New York Times Crossword, paul, Pop culture, PuzzleNation, Puzzlin' fool, Rich Norris, The Centenary of the Crossword, the daily telegraph, the financial times, the guardian, the times, Will Shortz by gmdirect. Bookmark the permalink.